Showers. Steady temperature around 49. North wind around 15 mph. Chance of precipitation is 90%. New precipitation amounts of less than a tenth of an inch possible. A chance of showers, mainly before 7pm. Cloudy during the early evening, then gradual clearing, with a low around 37. North wind 5 to 15 mph. Chance of precipitation is 30%. Sunny, with a high near 67. North northwest wind around 5 mph becoming calm in the afternoon. District Mission: "With community involvement, we will empower learners to become contributing members in our changing world." 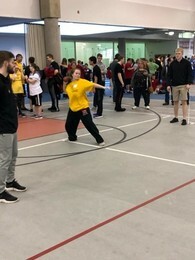 On Saturday, April 13th the Special Olympics track and field team traveled to Sioux Center to Dordt College to compete. Because of the colder temperatures the meet was relocated to the indoor track, thankfully! The team competed in several winning events! To start the meet we had field events where Cody Ludwig and Karrie both place first in the shot put. Jayden Johnson placed 2nd, Angie Garcia placed 1st and Kurtice Rollefson placed 2nd in the running long jump. Breanna, Brooklyn and Caleb Buenger all completed in the softball throw where Brooklyn and Breanna placed 1st and Caleb placed 2nd. Jayden Johnson competed in the 800 meter run where he placed 1st. Cody Ludwig, Mary Kozora, Karrie Kozora, Angie Garcia, and Kurtice Rollefson all competed in the 100 meter run where Cody Ludwig and Mary Kozora placed 1st. Kurtice Rollefson and Karrie Kozora placed 2nd in their division. Angie Garcia placed 4th in the running long jump. Caleb, Brooklyn and Breanna Buenger ran in the 50 yard dash where Caleb recieve a 2nd place finish, Brooklyn and Breanna placed 1st in their divisions. Those who attained a 1st place finish will move on the the state competition in Ames on May 23rd-25th. The ECLC program has a good challenge this year. We have a larger number of applications for four year old preschool than we have had in the past. This is great to know our district student population continues to grow. The challenge in our current setting is space and staffing to take on the additional enrollment requests. Last year we had a larger number of TK requests that created a shift in staffing and space resources to make two TK sections. We will continue to have two TK sections again this year due to requests for this age group. Our preschool program is accredited with the Iowa Department of Education and the Iowa Department of Human Services. Both of these processes provides several specific guidelines on requirements/restrictions of class size, staff requirements, and classroom space specifications. It was considered to expand the program to be able to accept all applications. This is cost prohibitive for the limited time that we will remain in our current building. In response to our anticipated enrollment numbers, the ECLC program will not be accepting three year old general education students for the 2019-20 school year at this time. We will review our ability for accepting three year old general education students in mid August. Depending on confirmed registration numbers of the four year old students, we may be able to accept some three year old students using a lottery system. Again, the decision is only for the 2019-20 school year based on enrollment applications. Each year we will consider the capacity we have for serving both three year old and four year old students. Mrs. Carlson from the Iowa Department of Public Health, talked to the Health I classes about the problems with smoking. Since they covered tobacco in 8th grade, she focused on Juuling and Vaping. The students are making posters with some of the facts from her presentation. They are going to ask some of their teachers if they can display the posters in different classrooms and other locations. Another group is going to make a Power-Point presentation. Other students are going to post their posters on different social media. Here are a few of the posters that will be on display at the high school. The Cherokee Middle School fifth grade under the direction of their teacher, Sue Nelson, was given the opportunity to help a staff member with a wonderful project to help those undergoing cancer treatments at the June Nylen Cancer Center in Sioux City. The fifth graders were recently awarded $250 from Project Jack sponsored by the Realtors of Iowa. 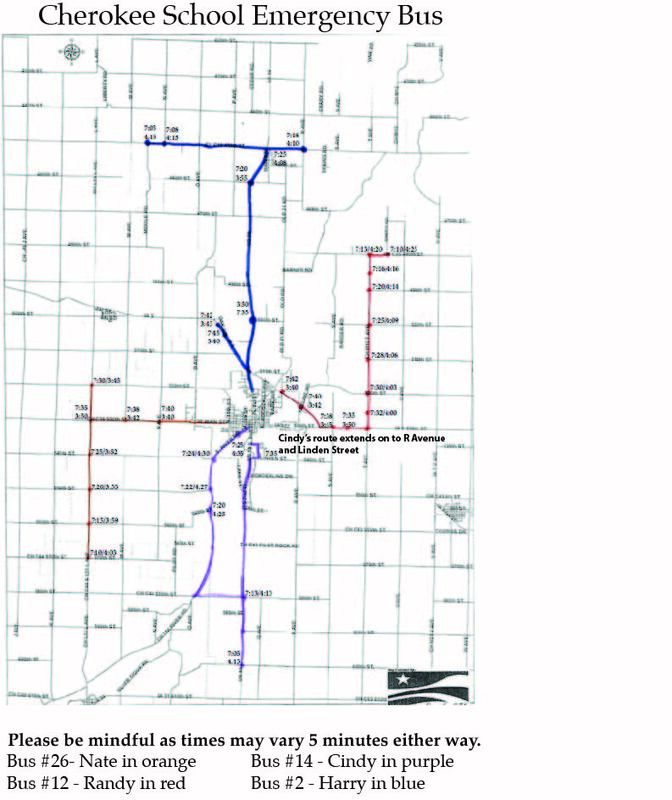 Project Jack originated in the Quad Cities area of Iowa in memory of Jack Lindaman. Jack Lindaman liked to make people happy and was always a positive light to those around him despite his health issues. Jack passed away in February 2010 at the age of six from spinal muscular atrophy (SMA). With Project Jack, his memory and loving spirit will continue on through the good deeds of children. Realtor Foundation of Iowa has created a fund to help students across Iowa to participate. The project gives fourth and fifth graders the opportunity to pay it forward in any way the class chooses. The original project was carried out five years ago with each person in Jack’s class at Alan Shepard Elementary School receiving $100 to pay it forward. The Cherokee Middle School fifth grade assisted one of our staff members, Kayla Reuter, in filling her 110 chemo bags with items patients would appreciate while taking chemotherapy at the June E. Nylen Cancer Center in Sioux City, Iowa. Mrs. Reuter received a tremendous amount of community support for her project. Each zippered bag was sponsored by a friend, relative, or colleague of Mrs. Reuter’s, and many people donated items for the bags, but a few more items were needed to make the bags even better. The fifth graders used their Project Jack funds to purchase Aquaphor lotion and hand warmers. The students made inspirational cards to include in each bag as a way of letting those undergoing chemotherapy know that someone was thinking of them. After all the items were collected, the students assisted Mrs. Reuter in stuffing the bags with all the donated items. Members of our community sponsored the zippered bags. Besides the lotion and hand warmers the bags included: hand sanitizer, shampoo and conditioner, puzzle books, notepads, thank you notes, pens, pencils, hard candies, stickers, lip balm, and tissues all donated by generous members of our community. Some patients will even enjoy some fuzzy socks! Thank you, Mrs. Reuter and the Realtors of Iowa for this wonderful opportunity! Mrs. Anderson's Human Anatomy and physiology field trip to the cadaver lab at briar cliff today. We spent time in the cadaver lab with the professor, toured the exercise science program, performing some of the tests, and also toured the campus. It was a great day! The students learned a ton from the cadaver lab! The 4th grade and 7/8th grade TAG students participated in a STEM Energy Festival at the 185th Air Refueling Wing in Sioux City. 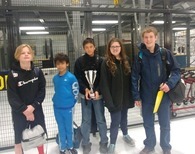 As part of the festival the students competed in a KidWind challenge in which they were to design and build a wind turbine prior to the event. The 7th grade students brought home a 3rd place overall win, and the 4th grade won "Most Innovative" design. This was a great learning opportunity for all students involved! Rotary Student of the Month for April 2019 is Isabel Gebers! Isabel was nominated for this recognition by staff members. Isabel participates in concert band, jazz band, marching band, group speech, individual speech, National Honor Society, Braves Achievement Club, tennis, and is a member of the Tomahawk Court. A quote from one of Isabel's teachers, "Isabel is an all around great student who excels in everything and is committed to becoming the best at her future endeavors. Isabel deserves recognition for her work with both school and church." Congratulations to Isabel! 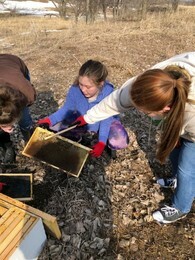 In May of 2018, beehives were installed in the Outdoor Classroom at Cherokee Middle School. The hope is to connect Hawkeyes students with conservation and real world events. Pollinators are on a downward trend due to many factors but are so important for human survival. Overtime, bees will produce honey from plants in the outdoor classroom and surrounding area that students will collect and potentially sell as a fundraiser for the program. Collecting and processing the honey will also expose students to the idea of farm to table, instilling a sense of place, and a greater idea of how all things are connected. There are several different types of bees, each type having its own characteristics varying in honey producing ability and varying demeanor. Bees are ordered from a trusted supplier by the NUC, which means that I receive 5 frames with an Italian queen bee that is already laying eggs and approximately 10,000 workers. By mid-summer, the colony could contain around 60,000 bees. Some hives can get as large as 100,000 bees.